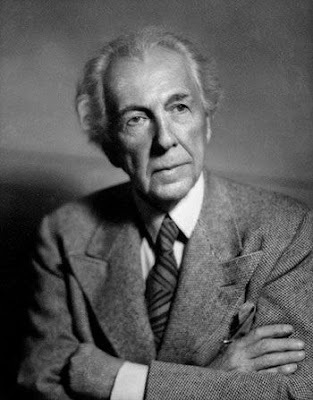 March 30, 1945 -- Frank Lloyd Wright addresses the Chicago Chapter of the American Institute of Architects at the Casino Club. He talks at length about "the philosophy of organic architecture" [Chicago Daily Tribune, March 31, 1945] and makes this observation when asked about the future of cities, "Cities are just as dated as static and the radio. Americans just want to live. Cities are not important. The reality of buildings consists of space within -- to live in. The old period of putting the outside in -- is gone." The photo above was taken in 1945, the year of the Casino Club address.